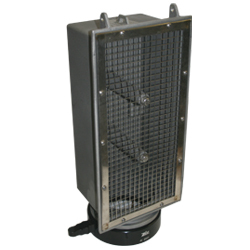 Strainer box only, 4-1/2" NST: QUIC-DRAFT floating strainers help draft water from virtually any source, deep or shallow, and insure a sufficient volume of water at draftfrom pools, ponds, , portable tanks, etc. The float has a large carrying handle for easy transport. The puncture-resistant polyethylene float is foam filled for years of maintenance-free service. When mounted on the float, the strainer box may be locked in place to prevent banging against carrier's legs. The strainer box can be easily detached, even with a gloved hand, for use as a box strainer or for storage. The box strainer is more efficient than a barrel strainer and it may be left attached to the hard sleeve.